A founding Titan is finally, finally making his debut on Young Justice. Only took a cancellation and a third season years later on a streaming service to do it! 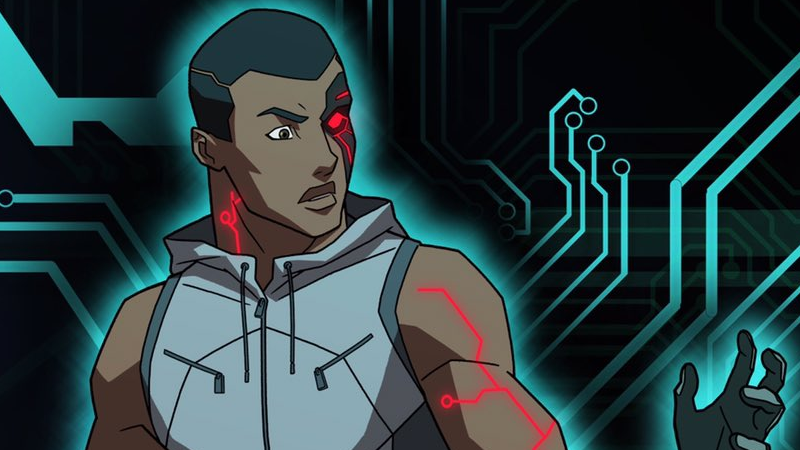 IGN has revealed the first look at Victor Stone—seemingly mid-transformation into his Cyborg suit—as he’ll appear in Outsiders, the long-awaited return of Young Justice currently airing on DC Entertainment’s streaming service, DC Universe. Voiced by Zeno Robinson, Victor will also be joined by his father, Silas, voiced by longtime Young Justice actor Khary Payton (who also voices Aqualad, Brick, Black Manta, and Black Lightning). It’s always been kind of baffling that Vic has been left out on Young Justice, especially as several of his fellow alumni in both the Titans and Justice League have steadily made their appearances on the show (which has a huge cast of characters). But the past few episodes of Outsiders have been sowing the seeds for Vic’s New 52 origins to begin unfolding on the series, with nods to his promising high school football career and his father getting a secretive bit of Reach technology delivered to his offices at STAR Labs. Seems like it’ll potentially be that Reach tech instead of a fourth-world influence like the Father Box accident that lead to Vic’s transformation into Cyborg in the New 52, but we won’t have to wait long to see what’s in store for him—Victor and his dad will make their Young Justice debuts in “Another Freak,” one of four episodes dropping on DC Universe this Friday, January 25, as part of Outsiders’ midseason finale.